As most of you know, I’ve been here in Belgium since November 3. I’ve been racing, training, thinking, smiling, and just trying to get as much into my brain as possible. This means asking questions. Listening to lots of advice. Trying things. Failing. Succeeding. And then doing it all over again. This my third season of racing cyclo-cross in Belgium. While I haven’t been ripping up the results sheet, I have made some big strides forward. My fitness is in a great spot. My head is screwed on tight. My technical skills are improving. And I’m hungry. Actually, make that starving. I’m starving for improvement. For gains. For that extra bit of success. I really just want to learn and “get it” so that I can put everything together and ride like I know I can. This is not easy. In fact it is damn hard. For me to make this jump, I actually need to un-learn some of the things I’ve been doing. And then I need to learn new skills. This cannot be done over night. Baby steps is all I can take. Sometimes it is hard to remember this. 10,000 hours as the deep thinker Gladwell pointed out. But what if you don’t have 10,000 hours? Well, in my case you listen and keep your eyes open. This is what I did yesterday. Wednesday is the “woods” day. 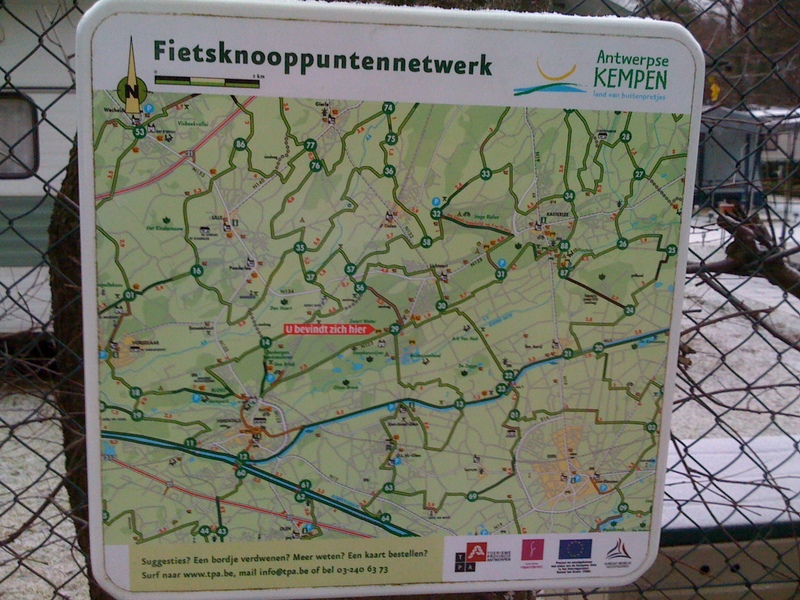 So Marc and I loaded up the Kangoo and made our way to Floreal Lichtaart (Kasterlee) to train on the cyclo-cross course. I’ve written about this place before but it is worth repeating that this place is the “bomb” for training. The course has pretty much all the aspects of any type of cyclo-cross course you will come across. Fast descents. Tight corners. Sandy climbs. Steep run-ups. And depending on the weather – mud or frozen rutted ground. Here is a photo I took of the map attached to a post in the parking lot. It shows all the trails and riding you can do from the parking lot. Marc and I rode around together with Marc giving me some great pointers on how I can improve and most importantly giving me massive heaps of encouragement. This makes such a difference when along with being told what to change, you’re reminded of how far you’ve come. After a bit of riding we hooked up with Bert and the fast Masters gang. This is where the real learning came in. Bert didn’t say much. He didn’t have to because his advice, will realize a different level of riding for me – if I can make the change. Sounds simple doesn’t it? In essence it is. But in practice, it is hard to do. I’m working on it. I’m focusing on lightly gripping the bars. On relaxing my upper body. On looking ahead and taking a photograph of the course so I don’t stiffen up when I get nervous or start thinking. I’m focusing on constantly pedaling – this way the forward momentum will help me roll over and through things like mud, ruts, roots, etc. Funny how the best advice is often the most simple advice. Doesn’t get much better. I’ll be out there again today working towards my 10, 000 hours and putting my bike to work.